When I first came across the notion of the, so-called, 'imaginary' number it was within the context of physics so it seemed totally natural to me—ie, the imaginary unit, in particular, not as a value needed to solve certain equations, but as part of a dynamic geometric point needed besides the x and the y specifications to complete the description. It was until much later that I realized what unreasonable gauntlet it had had to take (as a 'number', per se) in order for it to be accepted as having the proper bona fides of a number. Number, in fact, as a primitive concept, is always more than what we bargain for. The hapless Pythagoreans and the unruly diagonal of the unit square (an irrational number written as, √2)*; the negative numbers that just lingered on like persistent haze after every, innocent commercial transaction (post-dark ages); the number zero (an assault on commonsense, surely) that was needed to complete a new 'orthography' of numbers (the Hindu-Arabic numerals: 0-9). The internecine wars, the highly-personal gouge-out-eye brawls, intrigue and betrayal—not to mention the seemingly intractable cultural, and, even, sectarian strife—the history of mathematics is brutal (to say the least!). *double irony: the number is derived by applying their famous theorem. The imaginary unit (the one that satisfies the equation: x2 = −1) is no different than the other numbers that have preceded it down through human history. It, like the other numbers, is more than is obvious and it, like the other numbers, serves many functions. It is utterly invaluable to the two great pillars of our current understanding of the universe: classical and quantum physics. It is in this respect that I admire the imaginary number the most—ie, as a geometric construct. 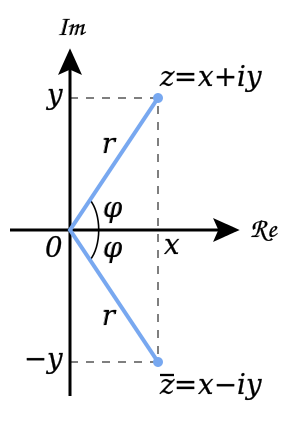 The two famous numbers of the Cartesian coordinate system (x,y) may be interpreted as extending not only east and west (x) but also up and down (y) which together make up a two-dimensional plane that is sagittally-oriented (ie, facing us directly and flatly); the less-famous number (often written as: √-1) is required to describe the electromagnetic field more completely, say—which, as it happens, occurs in more than just a two dimensional plane (x,y) but needs the north/south extension to fully 'account' for its allowable and observed orbits. As a number x + iy, the concept is a bit more complex (excuse the pun) than casual conversation can ever hope to disclose justly, but as a geometric concept there is no 'addition' involved. The entirety of the number acts exactly like a point described by (x,y)—only the imaginary plane extends the x axis north-south and not up-down, thus opening up a 3D landscape (x,y,z) that is more intuitive than what we'd expected. 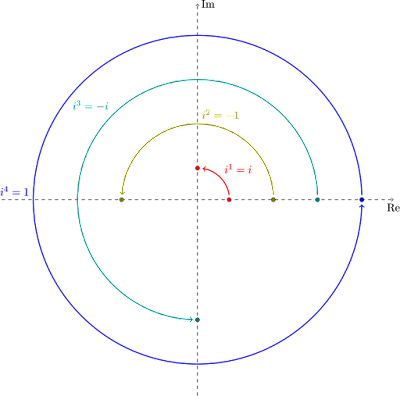 It does more than just sit there: the imaginary unit (i) is also known as the rotational operator—meaning that it has the capacity to describe periodicity of a trigonometric function! 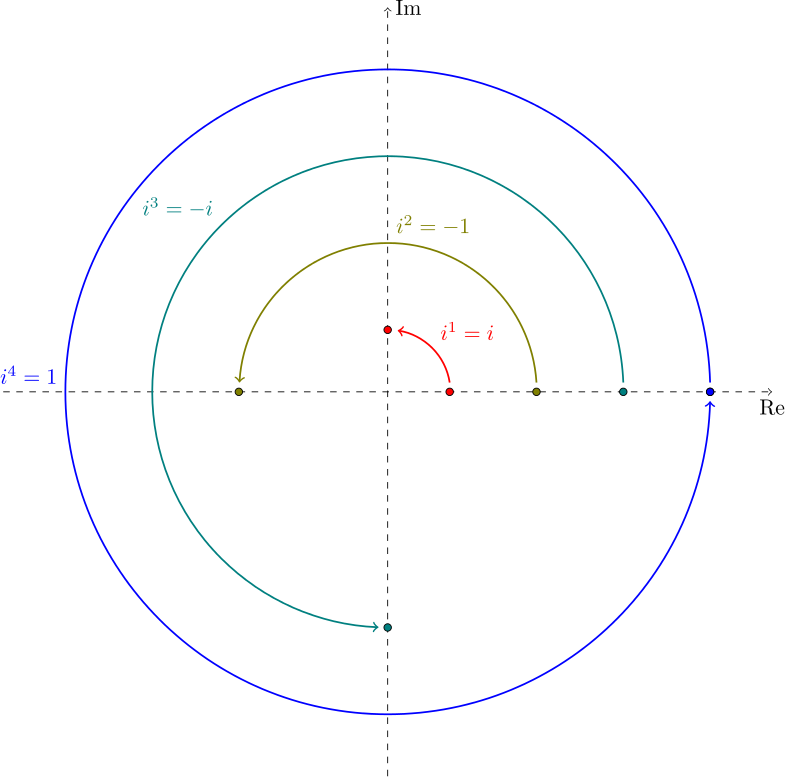 The number 1 (the right side of x) is the starting point in the cycle above where y = 0—as in: 1 + iy; and the next result, x = 0—as in: x − i1, which is 90 degrees from the starting point; and, continuing down the return cyclic values, the same process (with opposite signs) is repeated for the negative values. Once I learned the general forms of the complex number, I linked the arithmetic operations to their geometries and learned to visualize these wonderful numbers like one would learn to read music and hear the sounds. I'm no calculator but a highly visual person. I know it's primitive way of regarding such beauty but it has its certain charms: the insights (or, perhaps they are delusions) that come up come like a picture show. Mesmerizing. wanna see something freaky I did?